What is Christmas without a Christmas tree standing pride of place in your hall, dining area or living room? And decorating the tree is one of our most-loved Christmas rituals, with many of us making it a family activity (even if you do move everything the kids placed into the 'right' place after they head to bed). 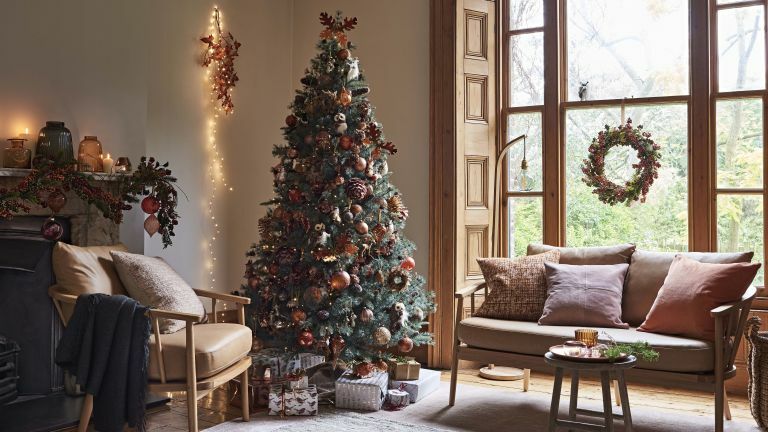 Whether you are choosing a real tree, or have opted for an artificial one, the decorating principles are largely the same – just don't water your artificial tree... We explain the steps below to decorating your tree like a pro – and there's a handy video in which experts from Pines and Needles show you how it's done. Even the most creative among us would struggle to make a sad twig of a tree look full of festive cheer, so make sure you choose the right tree to start with. Measure up to check that the tree won't overwhelm the space. You need at least half a foot to the ceiling for the topper and space around the sides to clear the walls and furniture. If you are choosing a real tree, look for glossy leaves, then give the tree a tap on the ground (with the stump) to check it does not drop lots of needles. Your tree needs to be placed away from fires and radiators, but near to plug sockets. Ensure it does not obstruct doorways, or block too much light if you are positioning it in a window. Tip: To protect your flooring, place the stand on newspaper or something waterproof. You can hide this with a tree skirt later on. If you are worried about tree resin damaging a carpet, find a large circular rug to place under the tree. Make room for the tree and a bit of extra room to work in. If you are using an artificial tree, set it up according to the instructions. For a real tree, you might want to put some sheets or newspaper down as you work to catch needles. Position it in the stand and screw into place – this is often a two-person job. A six foot tree will need a medium-sized stand with a water reservoir. Cut the net from your tree and prune long uneven branches if necessary. Trees often have a best side, so turn to suit. Tip: Only fill the stand with water once you are happy with its positioning, otherwise spillages are inevitable. Check your fairy lights work before putting them on the tree. You will need 100 lights for every foot or foot and a half of tree. A six foot tree will therefore need 400 to 600 lights, but feel free to go for more if desired (you can never have too many...). For a dense lighting look, start at the bottom of the tree and wrap the lights around the trunk to the top. Work your way back down the tree, laying the lights towards the outer branches. If you have gone for extra lights, you might have enough to do a third trip around the tree. Need new lights? Don't miss our pick of the best fairy light design ideas. For a contemporary look, you might choose to forego the tinsel, but if you are using it, put it on before any hanging decorations. Arrange the tinsel or beads by following the natural tiers of the tree. Get your largest decorations together and distribute evenly across the tree. You might want to keep the biggest nearer to the base of the tree for visual balance. It helps to add your decorations one colour at a time so that you get a nice spread all over. Now you can add any smaller decorations you have. Again, spread evenly across the tree for a good range of shape, colour and type. Longer, daintier ornaments work well near the end of the branches, while chunkier objects look more at home nestled further into the tree. Tip: Keep the lights on as you decorate so you can position twinkling decorations for maximum impact. If you want even more texture, you might want to include bows, feathers, ferns or pine cones. Lay these on the branches. Tip: If you use any edible decorations such as chocolates or candy canes, keep them out of reach of pets. Chocolate is highly toxic to dogs. Next put on the Christmas tree topper, such as a star, angel or fairy. Most come designed to sit on the top of the trunk, but you can use florists' wire to make it more secure. Find all the best Christmas tree toppers in our buyer's guide. Tip: A Christmas tree skirt can be used to hide the base of the tree. Fabric ones can be wrapped around the stand once you have finished decorating. If you are using a solid one, you need to position the stand in it before putting up the tree. Make sure the water reservoir on your tree stand is kept topped up. The average tree will need one to two pints of water per day. A real tree will drop needles every so often. This can be exacerbated by the tree being too warm and, of course, it is best to get your tree closer to Christmas to ensure it looks its best on the big day.